Daily Shower Spray Recipe - Easy, Inexpensive, Effective! Save money and time by making this homemade daily shower cleaning spray recipe part of your daily cleaning routine. Just a few quick sprays after the final shower of the day will keep mold, mildew, and soap scum away. Plus, it leaves your shower smelling fresh! I’ve been using this homemade daily shower spray recipe for years, and figure it’s high time I shared it with you. See, cleaning shower walls and glass doors is one of my very least-favorite chores. I’m short and can barely reach the top of the walls. I certainly can’t reach the shower head to aim it at the walls and rinse them after scrubbing. What a pain. 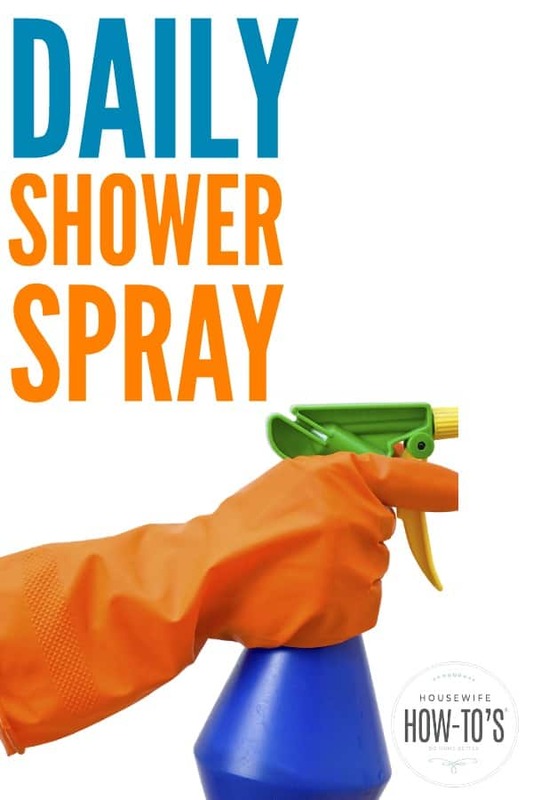 Fortunately, using this simple, all-natural daily shower spray means I rarely have to scrub anymore. Isn’t it wonderful when something that only takes a few seconds can shave off several minutes from your cleaning routine? Choose the recipe that suits your shower materials. If you absolutely cannot abide the smell of vinegar — though it disappears once dry — the second recipe will get your shower clean but won’t leave the same shine. 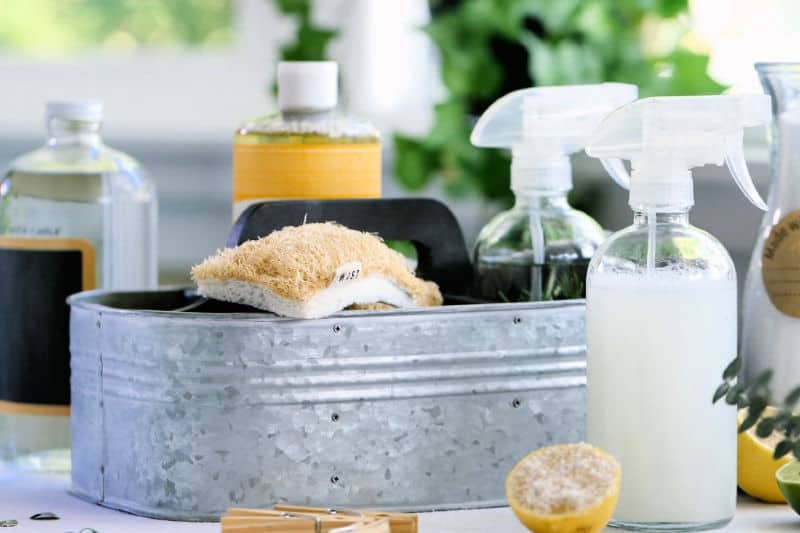 Keep in mind, these homemade shower cleaning sprays are designed to be used between deep cleanings. The ingredients prevent mold and mildew while also eliminating odors and reducing germs. Each of the daily shower cleaning sprays prevent soap scum but don’t get rid of soap scum that’s already there. For that, you need a homemade soap scum remover. Once the scum’s gone, this spray will keep it from coming back. This one uses hydrogen peroxide, which degrades quickly when exposed to light. To keep that from happening, mix it directly in the hydrogen peroxide bottle then screw a spray nozzle on and you’re good to go. 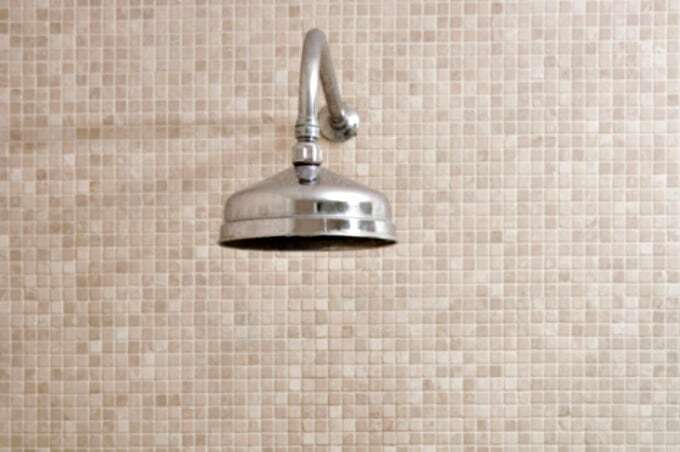 The vinegar-based daily shower spray is safe for acrylic showers. Hi there, loving the advice! I am curious if I am not loving the smell of vinegar for my regular fiberglass shower could I just use the one for stone and marble? You sure could, though it won’t get your fiberglass as shiny as the other recipe. Which is safe to use on natural stone? I heard vinegar is not safe to use on stone showers? The vinegar-free alternative is provided for those who have natural stone. If you spray daily yourself, after the last person has finished, must you stand in the shower to get the inside of the glass door? My door folds and you cannot reach all of it without closing it. I’d just fold it a little and reach around to spray the inside of the door, Mary. If that’s not possible then, yes, you’d need to stand in the shower to spray the door. does the vinegar mix work on slate or can this damage the stone? Thank you. Vinegar is too acidic for stone, but the other two recipes would be fine. Be careful with the rubbing alcohol. I bought a knock off spray from the $ store, that did a great job of cleaning the shower, but it ate through the caulk at the bottom of the shower. We ended up spending more in caulk and time. I’m so sorry that happened, B. Those Dollar Store cleaners can cause a number of problems that wind up costing more money than one saved. We just cleaned our way into an old house where the sinks, shower, tub and toilets were gross. They were brown with scum. After trying four other recipes including vinegar and even SOS pads, a friend suggested Bar Keeper’s Friend! I was amazed. Every one of the items listed above look brand new. Wow that’s amazing thanks so much Katie! Sorry I misread the weekly spray and wipe for the daily. Thanks for this great website, it’s so helpful! I just wanted to clarify the daily routine, spray with homemade spray then “wipe”, but what do you recommend to wipe with – a squeegee, cloth (microfibre, cotton, or…? ), or a paper towel? Hey, you’re making extra work for yourself, Terry! There’s nothing in the recipe or the daily routine about wiping the shower after using the daily spray… that’s what makes it convenient! Does this work well on glass shower doors too? This works to prevent mildew, mold and soap scum on tile, glass, and fiberglass. It’s very important that you first get rid of any soap scum, then this spray will prevent more from accumulating. Fortunately, getting rid of the soap scum isn’t difficult. Try my homemade soap scum remover — you spray it on, wait a while, then wipe the nasty stuff away. Comment: I love your website! I am attempting to reform my poor housekeeping skills, and your advice, especially the natural cleaners recipes, are very helpful. Thank you for your hard work, and your leadership and inspiration! Thank you so much, again, for all your great advice! Another thing that helps is running the bathroom fan for 15 minutes or so after you’ve sprayed. That also prevents mildew, so it’s a win-win solution! hi Katie! I would like to know, do we need to rince it after? When do you do it? After each shower, after the last shower of the day? No need to rinse, Danielle. After the last shower of the day is fine!